When facing piles of notes that we want to save, what should we do? Now, this problem can be easily solved by Cloudmemo. You can sync your handwriting notes to the Cloud such as Evernote, iCloud, Dropbox etc, and then you can check your note records via your mobile internet devices anytime, anywhere. Using Cloudmemo is as easy as 1-2-3. Just keep the way you are writing on the standard paper and all your notes will be recorded and digitized. Your smart phone will capture your digital notes via Bluetooth and push them to the Cloud automatically. All the notes can be saved, filed by date and you can preview and search any notes freely. Without Cloudmemo, it might be very difficult for you to find the exact note you took some time ago, but with Cloudmemo you can find any note you want quickly from the Cloud, in addition, you can share your digitized notes to your families, friends, colleagues and classmate via mail or social networking as you like. 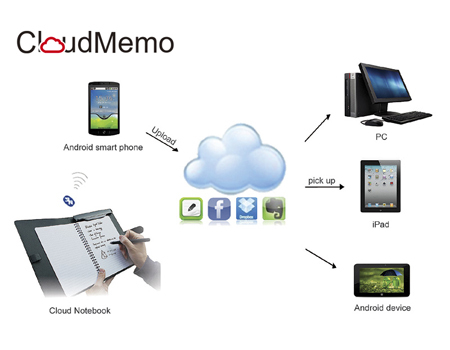 Cloudmemo provides you the smart solution to save your notes in the Cloud forever. Magic Cloudmemo! If you want to know more information about this innovative product, please do not hesitate to contact us, you will never miss superior user experience.